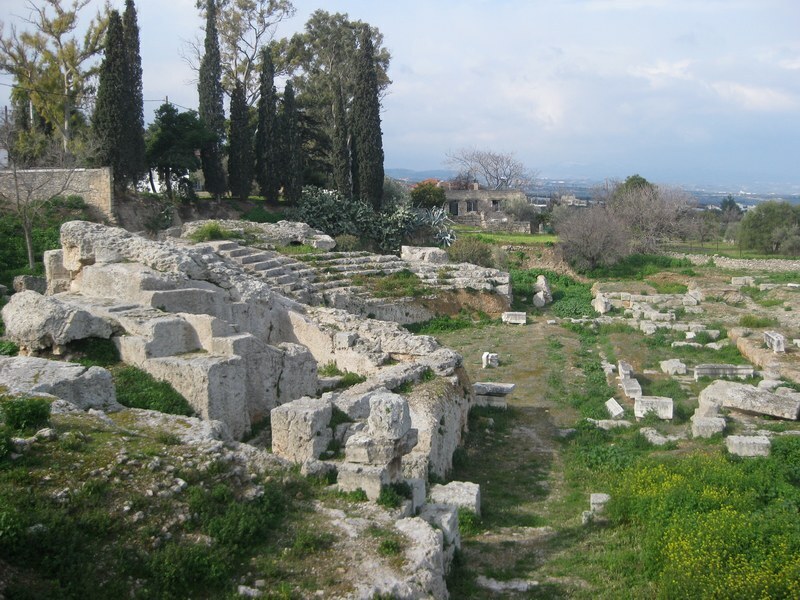 The Odeon of Ancient Corinth is built on the northwest of the Ancient Corinth agora, south of the Theatre, and on the hillside, west of Apollo’s temple. 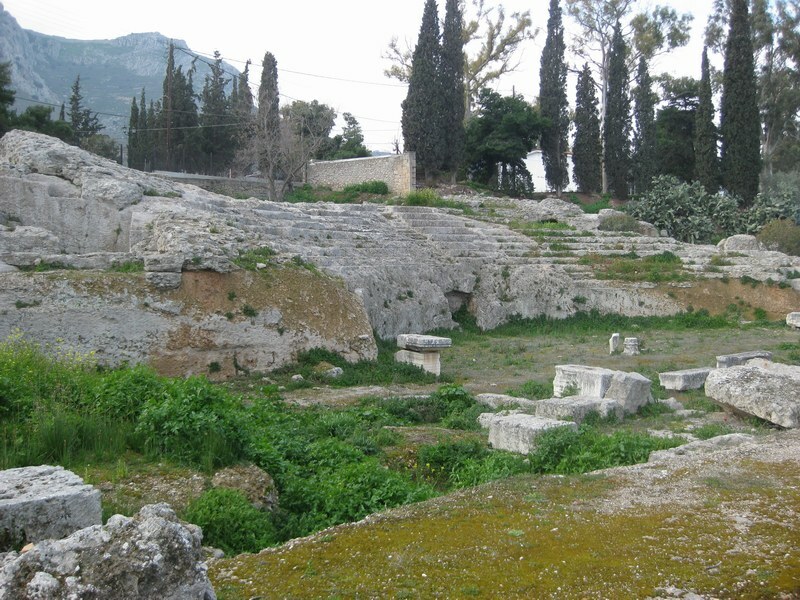 The Odeon is at the Municipal District of Ancient Corinth of the municipality of Corinthia. The Odeon has a semi-circular auditorium, connected to the stage. The lower part of the hollow was divided into four sections by three passageways. Only a few of the lower rows of seats of the hollow could be carved in the rock, while all the upper section had to be built. The supporting foundation of the seats in the upper part of the hollow resulted in radial walls supporting the vaults. Three construction phases have been identified at the Odeon. 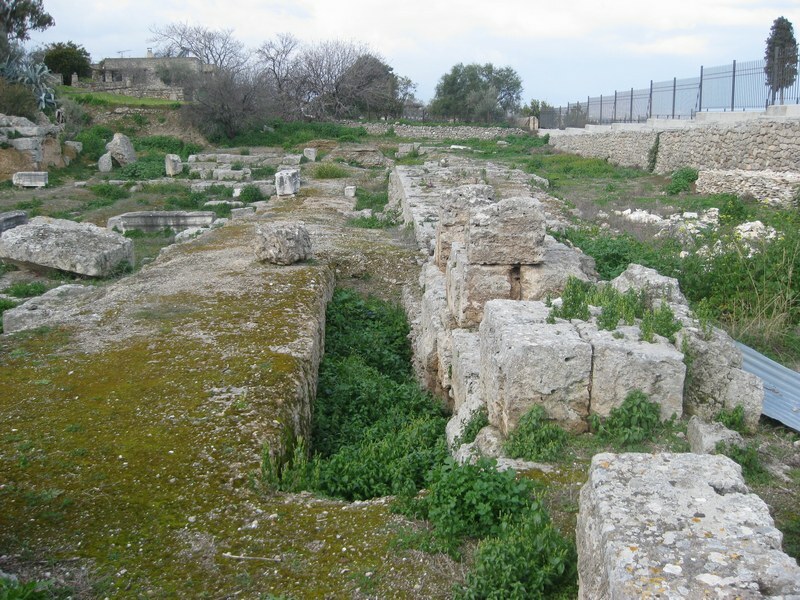 The Odeon was built in the last third of the 1st century A.D. The hollow had a capacity of 3000 spectators and, the scene had three entrances. It seems that the proscenium had painted decoration and marble columns of various colors. There was an underground corridor that led to the orchestra which was used by the actors. Later it turned into a pipeline for the collection of water from the building. In the second half of the 2nd century A.D. the building was reconstructed at the expense of Herodes Atticus. The northern facade of the Odeon was covered with marble. A large open courtyard with colonnades on the eastern, western and possibly northern side was built between the Odeon and the theatre, forming a cohesive whole. In 225 A.D. the Odeon was turned into an arena for beast fighting and duels. The scene was no longer useful, while the orchestra extended up to the proscenium. The lower seats of the hollow were removed and a vertical wall 2 meters high was built at a lower level than that of the lower rows of seats. Statues were placed in the proscenium while on both sides of the arena a room was built for the keeping of the beasts. The courtyard and the northern facade of the building were destroyed in the early 4th century A.D. and the material was used in the final reconstruction of the proscenium. At the end of the 4th century, the building was completely destroyed by a fire that had probably occurred during the invasion of the Alarich Goths. Subsequently, they may have used parts of the Odeon as private habitats. The Odeon is built on the hillside, west of Apollo’s temple. Three construction phases have been identified at the Odeon. 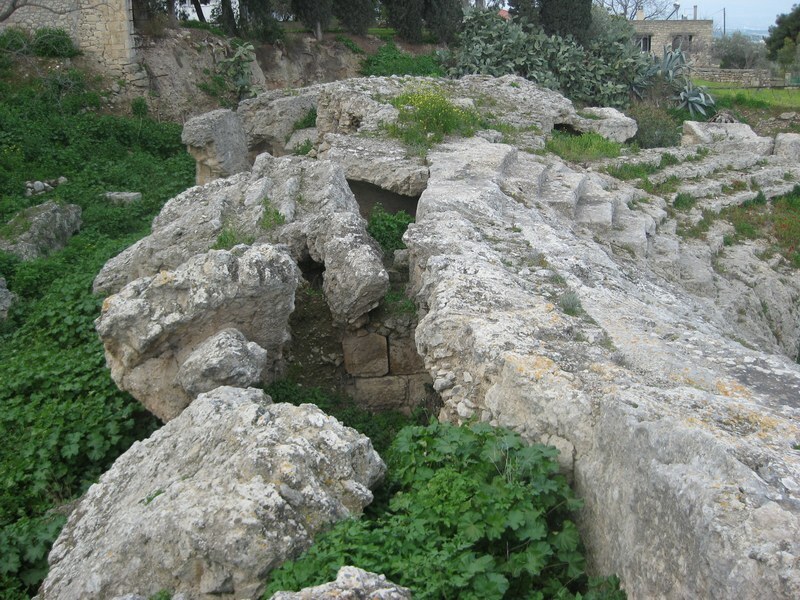 The Odeon was built in the last third of the 1st century A.D. Subsequently, it was later reconstructed by Herodes Atticus. In about 225 AD, the scene was no longer used and the orchestra area was extended in order for the Odeon to be used as an arena (the Arena period). There is photographic and design documentation from the A.S.C.S. in Corinth X (1932). Corinth, Volume Χ, ”The Odeum”, 1932, Oscar Broneer. NW of the agora of Ancient Corinth and south of the theatre in the Prefecture of Ancient Corinth, Corinth, and N.Corinthia. • Initial construction during the last third of the 1st century A.D. (also called the limestone period) reconstructed. • Reconstruction by Herodes Atticus in the 2nd century A.D. (also called the marble period) followed by destruction by fire in the early 3rd century A.D..
• Conversion into an arena: around 225 A.D. the scene was removed and the orchestra extended (the Arena period). The Odeon is built on the hillside west of Apollo’s temple. Only a few of the lower rows of seats could be carved in the rock, while all the upper section had to be built. The Odeon has a semi-circular auditorium, which is connected to the stage. The lower part of the hollow was divided into four sections of three passageways. The middle and eastern sectors are partly carved in the rock. To the east and west of the hollow, the soft rock was carved, on which they placed boulders for the seats. The underpinning of the seats in the upper part of the hollow resulted in radial walls securing the vaults. 1st PHASE: The first construction was mainly of limestone, but the vaults and the underpinning were made of cement and opus incertum. Marble and, perhaps other stones, were used in the interior. The walls, however, were either made of mortar or completely undecorated. The scene had three entrances. The proscenium appears to have had painted decoration and marble columns of various colors. There was an underground passageway that ended up in the orchestra and was used by the actors. It was later turned into a pipeline in order to collect water from the building. The hollow had a capacity of 3000 spectators and was divided into 4 tiers by 3 passageways, while the entire south side of the hollow had only a series of vaults. The rooms beneath the vaults may have been used as warehouses. 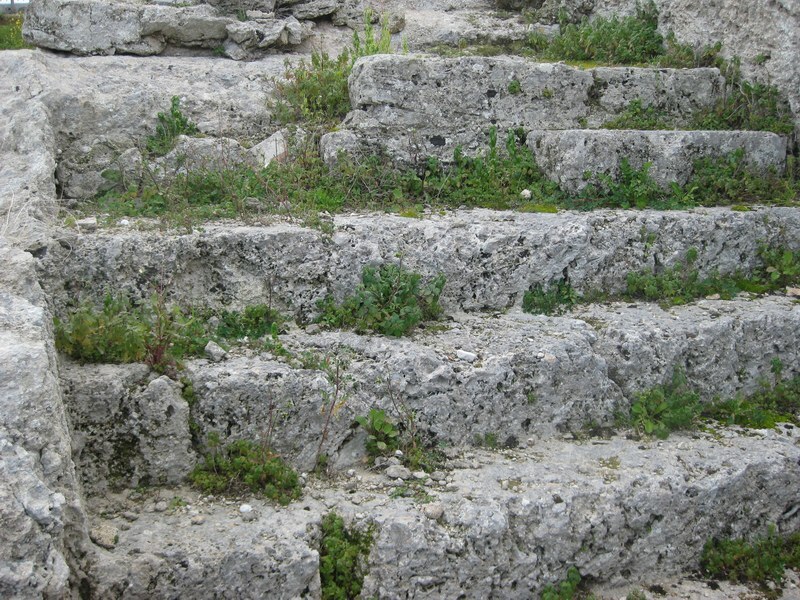 Due to the height difference between the southern and northern parts of the Odeon, there were stairs on the eastern side that led to the highest (southern) level. Respectively, there might have been stairs on the west side too. The second and third floor of the stage building, as well as the upper section of the hollow, have been completely destroyed and therefore could not be restored safely. Between the orchestra and the scene, there was a small passageway. On each side of the scene, there was a small room. For approximately 100 years, the Odeon remained unchanged. It may be that, at the time of Adrian, a statue of the emperor with military attire was mounted on the scene of the building. A large open courtyard with colonnades on the eastern, western and perhaps the northern side was constructed between the Odeon and the theatre, forming a cohesive whole. The colonnades of the courtyard and the rooms behind them had mosaics with geometric patterns. There were changes in the interior as well: the seats of the hollow and the floor of the orchestra were lined with marble. The scene and the façade were rebuilt. We do not know whether the roof that covered the building existed before the renovation of Herodes Atticus or if it was built then. There are no traces of internal struts to support the roof. There may have been beams starting from the back wall of the hollow. The reconstruction must have taken place around 175 A.D. and certainly after Pausanias’ visit to the agora. The building remained as it was for 50 years. Then, a fire destroyed everything except for the northern facade of the Odeon and the courtyard. 3rd PHASE: In 225 A.D. the Odeon was turned into an arena for beast fighting and duels. The scene was no longer useful, while the orchestra was extended up to the proscenium. The lower seats of the hollow were removed and a vertical wall 2 meters high was built at a lower level than that of the lower rows of seats. Statues were placed in the proscenium while on both sides of the arena a room was built for the keeping of the beasts. The courtyard and the northern facade of the building were destroyed in the early 4th century A.D. and the material was used in the final reconstruction of the proscenium. At the end of the 4th century, the building was completely destroyed after a fire that probably occurred during the invasion of the Alarich Goths. Subsequently, they may have used parts of the Odeon as private habitats. The Odeon is kept in moderate condition. 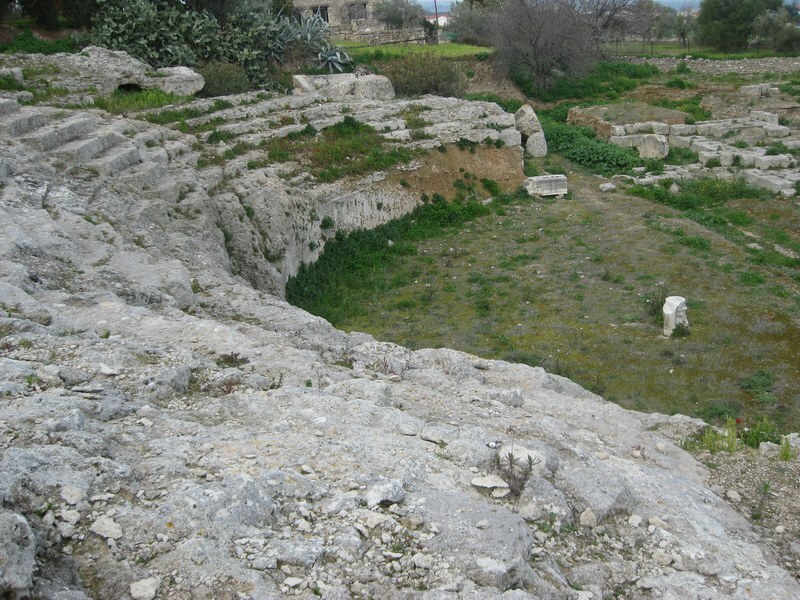 The Odeon of Corinth was initially identified by the A.S.C.S. in 1907. However, the main parts of the excavations were completed in two periods, during the years 1927 and 1928. In its current stage, it is not suitable for contemporary performances or any other events. The Odeon has never been used to hold performances. The monument is under the jurisdiction of the Ministry of Culture and of the Ephorate of Antiquities of Corinth. 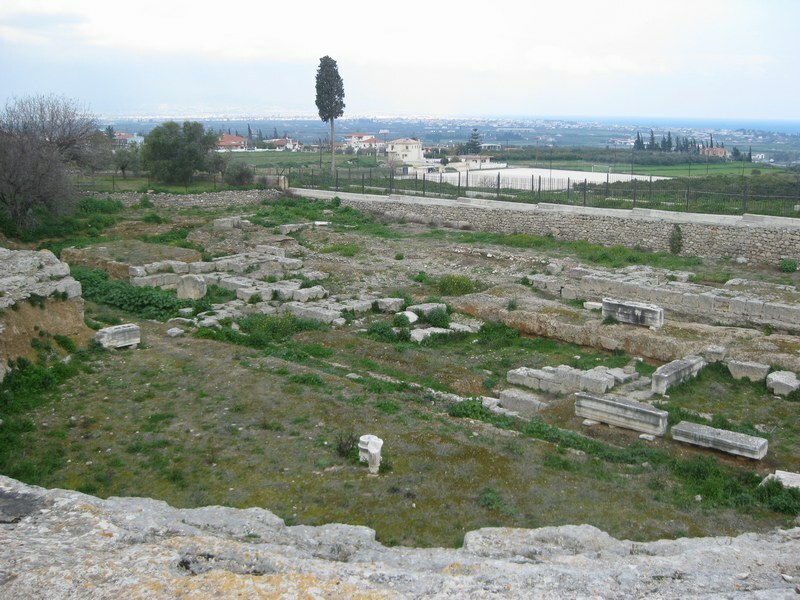 Ephorate of Antiquities of Corinth.